The South Asian community in the United States has a range of needs and concerns. As a community of over 4.3 million individuals, South Asians come from diverse areas, speak many languages, and affiliate with various religions. Many South Asians confront challenges, barriers, and obstacles in their daily lives. Around the country, South Asians have organized non-profits, collectives, and volunteer groups to address these challenges, raise awareness, and organize South Asians for social change. The National Coalition of South Asian Organizations is a network of community-based organizations that believe in common principles related to social change, and that provide services to, work with, convene, organize and advocate for South Asians in the United States. SAALT currently coordinates the National Coalition. South Asians navigate the intersections of gender, race, national origin, religious affiliation, class, immigration status, and sexual orientation, often on a daily basis. 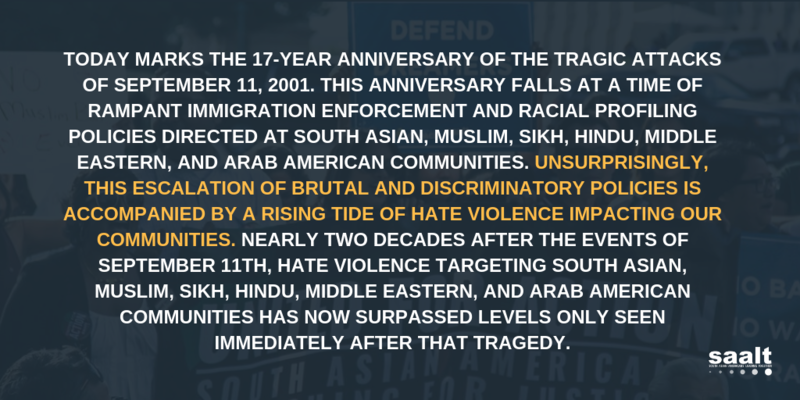 For example, South Asians have faced discrimination and marginalization ranging from immigration restrictions that began in the early twentieth century and continue to today; the impact of sexism, homophobia, and class-based bias; the struggle to gain equitable treatment in the workplace and at schools; the challenges faced by elderly and young South Asians; and the effects of targeting and profiling in the wake of September 11th, to name a few. Yet, South Asian experiences, needs, and perspectives are often missing from policy debates and decision making at the local and national level. A National Action Agenda comes about as a result of our recognition that issues affecting South Asian communities must be included in policy-level discussions in order to promote social justice.